In this experiment, we will use the Arbitrary Waveform Generator (AWG) on the Analog Discovery™ to create frequency modulated signals and apply them to a speaker. Modulated signals have one or more of their parameters (frequency or amplitude) vary according to some other signal. Modulated sinusoids are composed of a carrier signal which is modified in some way by a second signal, called the baseband signal. The baseband signal is the original frequency range of a signal before being converted or modulated. We will be examining amplitude modulation and frequency modulation. In amplitude modulation, the amplitude of the carrier signal is changed based on the baseband signal. In frequency modulation, the frequency of the carrier signal is changed based on the baseband signal. Our goal in this project is to obtain an intuitive feeling for the process of modulation. This experiment reiterates the use of the Sweep tab on the Analog Discovery's arbitrary waveform generator instrument. 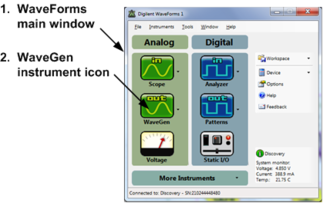 Use the Analog Discovery waveform generator to create frequency and amplitude modulated signals. 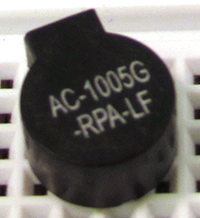 Click on Run AWG1 or Run All. An irritating noise, not unlike a police siren, should emit from your speaker. Try changing the carrier wave frequency and the baseband (FM) frequency. Try to interpret the effect of these parameters on the sound you hear. Note: Use ranges for the carrier frequencies that are over the human auditory range (about 50Hz to 20kHz). Use baseband frequencies which are considerably smaller that the carrier frequencies (about 100mHz to 20Hz). Try frequency modulating the signal with a square wave. (Just change the “FM” signal type to “Square”. 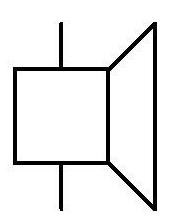 You should hear a signal with two distinct tones—an alternating high and a low frequency. 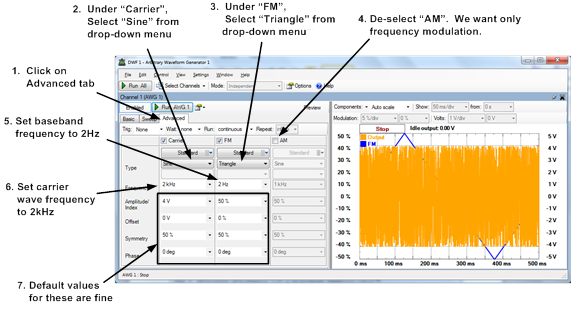 Choose a carrier wave frequency of 1kHz. De-select (un-check) the FM box. Select (check) the AM box. Choose a “Sine” AM signal. Set the frequency of the AM signal to 500mHz, and its Amplitude/Index to 80%. The default choices on the other parameters should be fine. Click on Run AWG1 or Run All. You should hear a tone from your speaker. The volume of the tone should increase and decrease with time, consistent with the fact that you are varying the amplitude of the signal with time. Try frequency modulating the signal with a square wave and a triangle wave. Do these have the effect you expect?